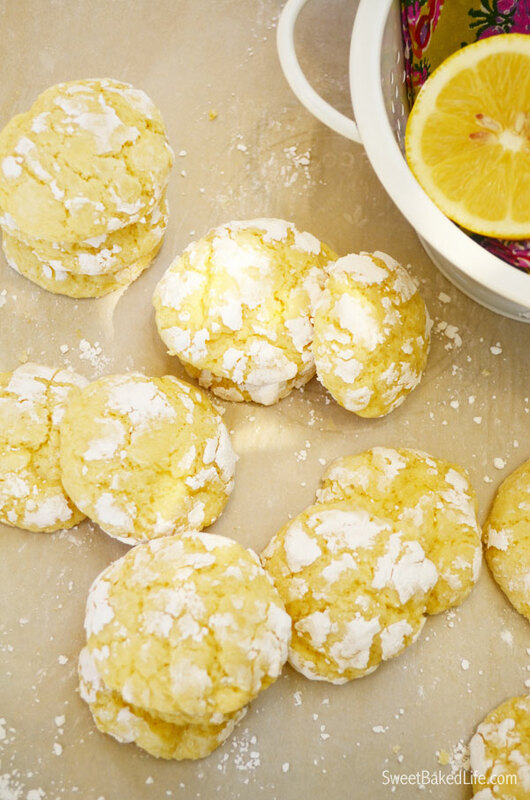 Keep the summer alive with a batch of these soft and delicious Lemon Crinkle Cookies. They’re not too sweet and will fill your day with happy sunshine. I just had to get one more summertime treat out there before the weather changes. Now around here, the weather has been all over the place. Last week it was in the 100’s and so far this week it is in the 80’s. Yes, it’s only in the 80’s — LOL! Before you know it, we will be complaining about that it’s too cold. Well, in my book, that would be a welcome change. And rain. Yes, rain would be nice too. We really need it here in California. By the way, have you heard about all the devastating fires that are happening here in the Northern part of our state? Turns out there are two very large wild fires that are close to us; the Butte fire and the Valley fire. So, not only has it been hot here, but now the smoke from these terrible raging fires are invading our area. Just to go outside is not much fun — it’s super hazy and the smell is terrible and my eyes have been watering for days. Luckily we did get a bit of precipitation, not really much to report as well there is a little breeze blowing around — hopefully that will help remove some of the gloom from the ash. Just glad to see the weather beginning to change, as this summer has been extremely hot so I will welcome the fall with open arms! 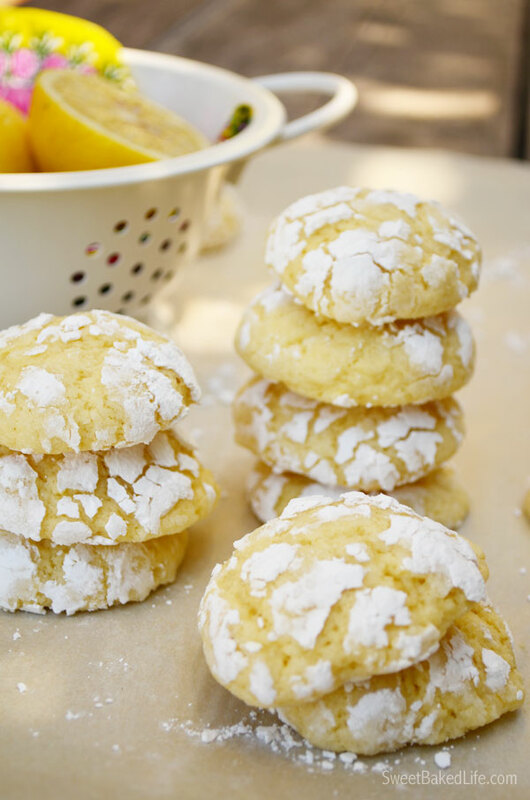 And so that’s why I’m treating you today to these Lemon Crinkle Cookies. They are oh so soft and fluffy in the inside and they will immediately put some sunshine into a possibly gloomy day. Or for that matter, will extend the summer just a bit! You start with a simple base of butter, sugar, lemon zest and lemon juice, then add in your flour and baking powder. Roll these lemony gems into some confectioners sugar and bake until perfectly cooked. I especially like the way these cookies look — and to top it off, they are melt-in-your-mouth fabulous! In a medium bowl, mix the flour, baking powder and salt. Set aside. In a large bowl of a stand mixer with the paddle attachment, cream the butter, sugar and lemon zest on high speed until light and fluffy. On medium-speed, add the eggs one at a time and mix thoroughly until smooth then add the lemon juice and mix until combined. Turn to low-speed and add the flour mixture and mix until the dough comes together – be sure not to over mix. Chill the dough for about 30 minutes to chill. When the dough is chilled, remove from oven. Line two baking sheets with parchment paper and set aside. Then cut some wax paper and place on your work surface. Using a 1-inch cookie scoop, scoop out the dough and place onto the wax paper. Then roll each scoop of dough into a ball. 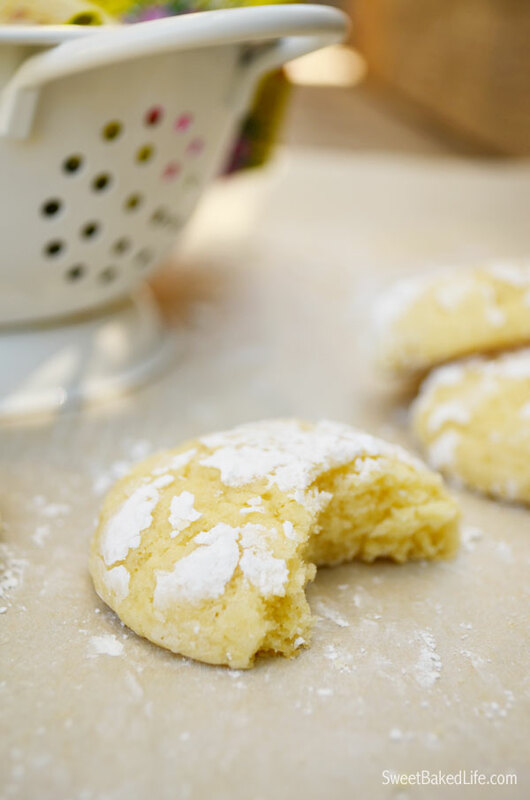 One-by-one, gently roll the dough balls into the confectioners sugar and place on the prepared cookie sheets. Bake 10-12 minutes. Remove from oven and let cool for about 5 minutes before transferring the cookies onto cooling racks. Let cool completely. Store in an air tight container for up to 5 days. Yields 32 cookies. 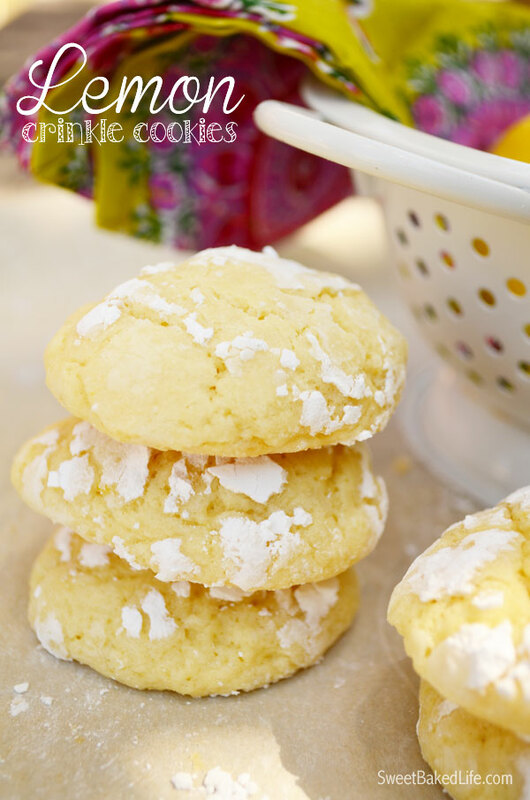 If you’re in need of adding a little sunshine into your day, whip up a batch or two of these Lemon Crinkle Cookies, and they’ll brighten your day for sure! Thanks mom, you’ve got to try them!!! Gorgeous photos Sheila – they look so yummy! Thanks Laura! They were fun to make, easy to photograph and even better to eat!! LOL!